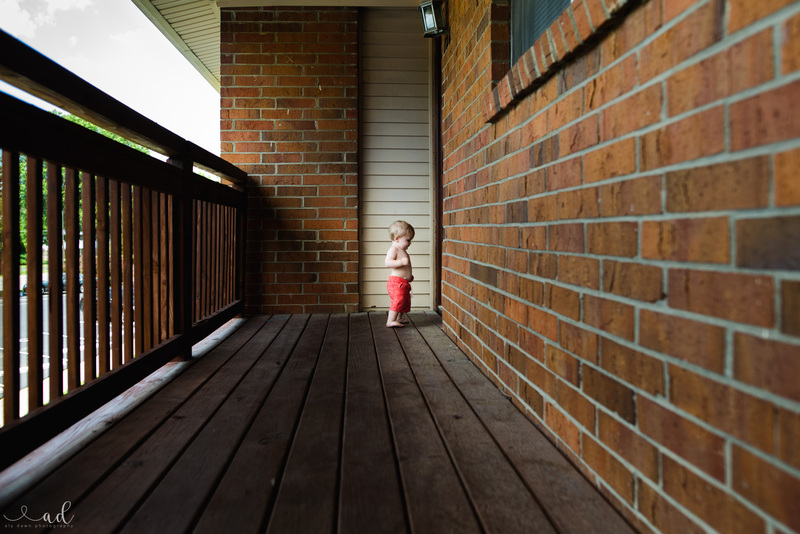 I’ve decided to do a series of blog posts pertaining to toddlers, this one is about compositions to consider. As most of your visiting my blog are probably aspiring momtographers (that’s a word, I promise), I figured you ladies wouldn’t mind some toddler tips and tricks. 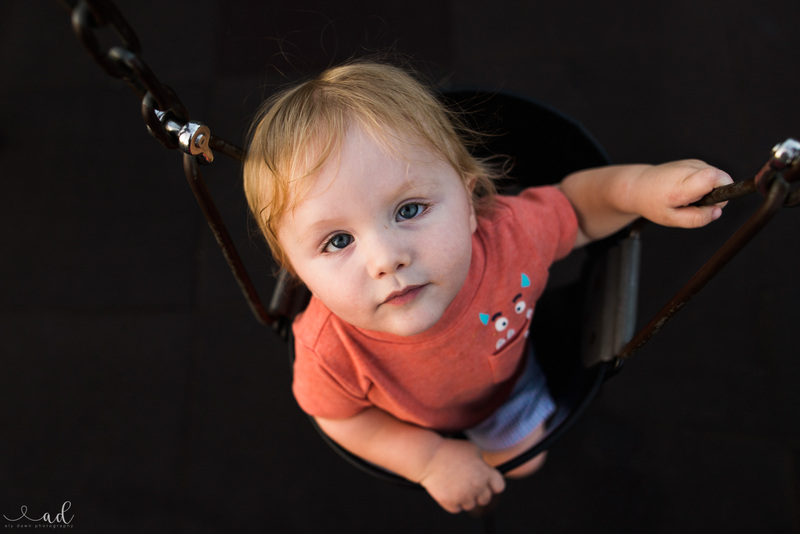 The first post I would recommend reading is Photographing a Toddler 101 – it gives you the basics to capturing great images of your toddler! 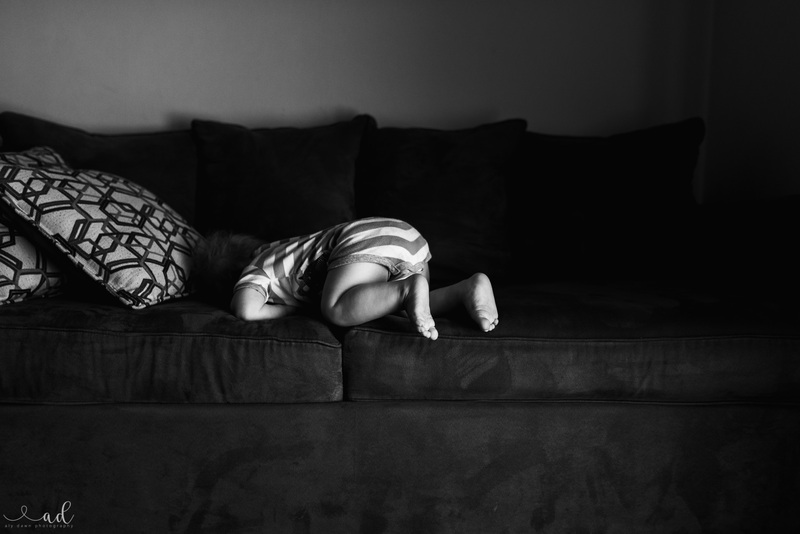 I wanted to reinforce that the most important thing to consider when photographing toddlers is patience. They do what they want, no matter how badly you want them to sit still and smile! Maybe that’s just not my style – I really love to have candid photos. The sit still and smile at the camera just doesn’t capture the emotion I crave. 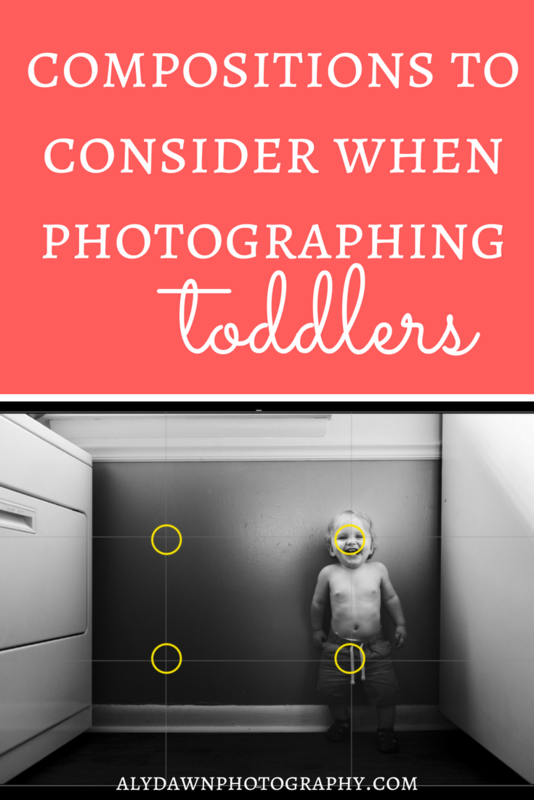 So if you stick around with me, you’ll learn more about how to photograph toddlers. If you haven’t already learned about manual mode, it’s essential! Especially when photographing in tricky light and photographing those fast toddlers! I have a new class – LEARN MANUAL: how to take control of your camera (by clicking on this link and signing up, you’ll get updates on anything new to this course). It’s not complete yet, but by signing up for updates you’ll be the first to know when it is ready! Plus some early bird pricing (yes, please!). This post contains affiliate links. Thank you in advance for supporting Aly Dawn Photography! I will briefly introduce you to composition. Composition in any type of art, is the ingredients that make up something. For music, this is the notes that make up the song. For images, this is the subjects, objects, that make up an image. There’s a ton of different ways to use compositional elements to make your image stronger and better. 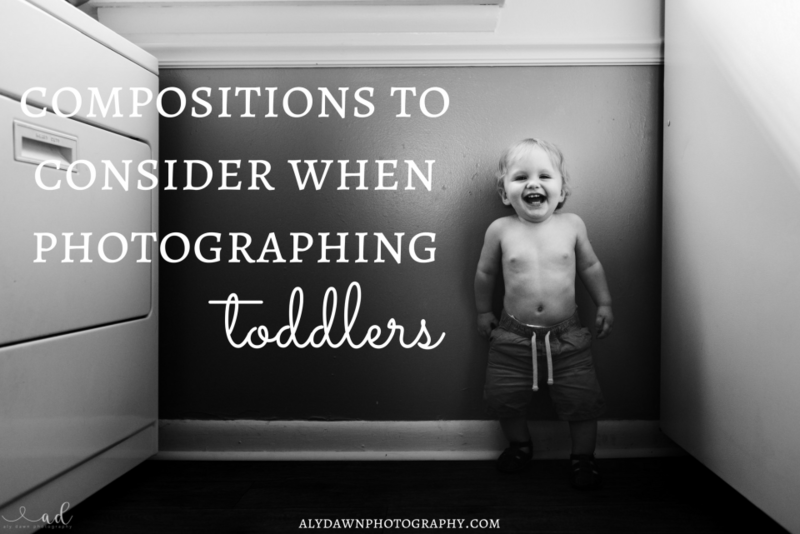 I’ll go into more details about all the different types of compositions below and why you should consider using them when photographing a toddler – they definitely add to the image. There are even more out there, but these are my favorites for toddlers. Now that we learned a little bit more about what composition is, let’s move on to how and why you should use these compositional elements and what exactly they mean. For this compositional tool, you have to picture your image split into 9 squares and placing your subject on one of the intersecting lines in the image. Take the image above, for example. My son is place on one of the intersecting lines. This composition is pleasing to the eye. It’s a rule that can be broken, though. Keep that in mind. Knowing the rule, using the rule, and breaking the rule are all important in composition. 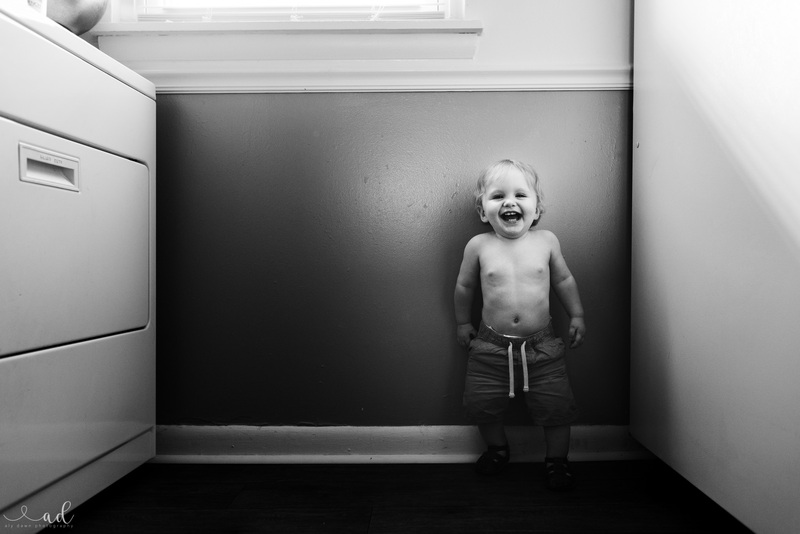 For this image, since my son isn’t centered between my fridge and my dryer, a center composition wouldn’t have looked as please. With him being frame the way he is, the rule of thirds lends a better composition. It pulls the eye right to your subject, and it doesn’t look awkward. When I take a picture, I practice with different compositions to see which one would work the best. 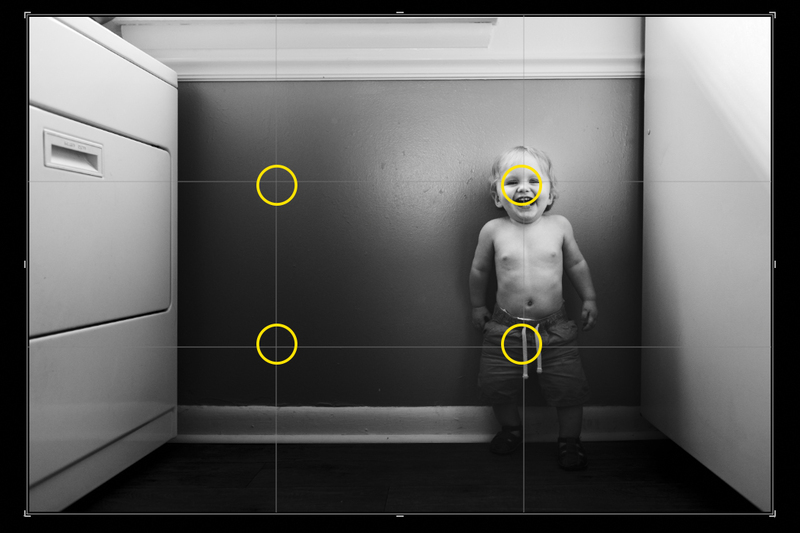 Rule of thirds is one I use quite a lot of! However, one of my favorite ways to compose an image is ‘framing’ which we’ll talk about next! The compositional rule of framing is exactly what it sounds like: you frame your subject with other objects in the frame. I use this technique a lot. I love it! Once you start looking for frames, you’ll see them everywhere. Trust me. 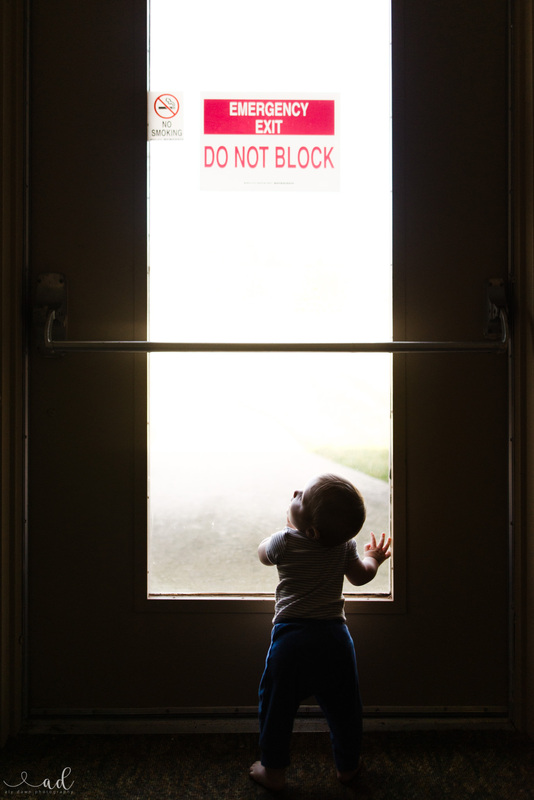 In the image above, my son is framed by not only the door, but the window, as well as the light! Yes, light can be used as ‘framing’. Frames can literally be anything and everything. You can use other people. The side of the frame, doorways, colors, the list goes on. Below my son is ‘framed’ between the door and the wall. I would also say he’s framed by light, as well. 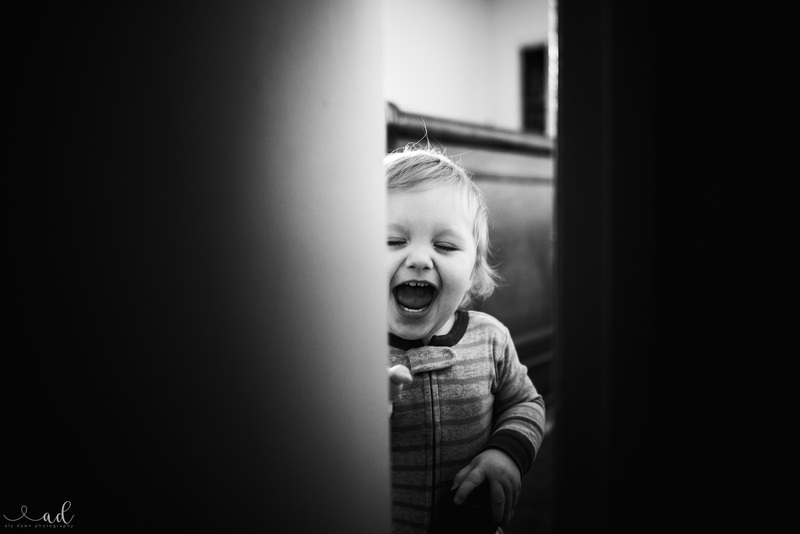 Framing is a great way to compose images of your toddler. It adds interest to your already cute photo. It draws the viewer in. It makes the viewer linger just a little bit. Framing an object is also so easy. Doorways are great, parks have a ton of framing tools to practice with. Architecture is full of frames, too! But there’s even frames in nature. You could frame your child with branches from the tree! Framing can also appear to be a ‘peaking’ in type of scene. It’s great for sleeping images like the one below! There are many many ways you can frame an object. Go try it out! You could even practice on something that doesn’t move as much as a toddler. In fact, I highly recommend practicing on stuff animals before making your way to your toddler. It’s easier to practice when the subject doesn’t move!! This one is great. What I mean by scale, is you take an image to show just how tiny your toddler really is. Like in the image above, you can plainly see just how tiny he is against that wall (he is also framed very nicely by the paneling and bricks!). Looking at this image you realize just how little and precious this boy is. He’s tiny! The best way to do this is to back it WAY up. (I would recommend having a helper to help in case the baby makes a run for it!). Include the environment in your image. This would be great to do at a beach, show just how tiny they are compared to the big ocean. You could do this at the park, the carnival, showing how little they are compared to the rides. This is a great composition to use on toddlers, because they are in fact, very little. This is great to get that eye contact and to also get a little bit closer. Details are so important to capture! A center composition is a good choice for when there is symmetry. 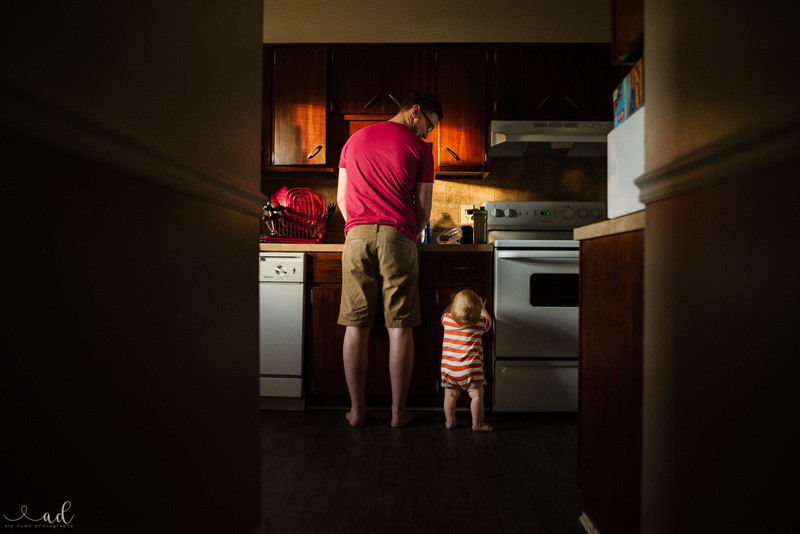 In the image above, my son and husband are ‘framed’ (another composition choice!) between the hallway walls. This pulls the attention straight to the center. Center compositions are probably the easiest composition to pull off, and one you’re probably already doing. Go a step further and really concentrate on what could make a center composition more interesting. Center composition can be good for when you want to simplify your frame. It also can be a good choice for detail shots. Using leading lines to center your subject can also help strengthen your composition. Be deliberate when you use center composition. Don’t always have center compositions. And when you do use center compositions, be confidant in your decision! I think faceless images are perfect for any genre of portraits! But I think it adds a level of mysteriousness to toddler images. Plus toddlers have cute everything (I wish I had cute everything) and those details deserve to be the center of attention, as well. In conclusion, your toddler is cute so any image you take of them is going to be adorable. 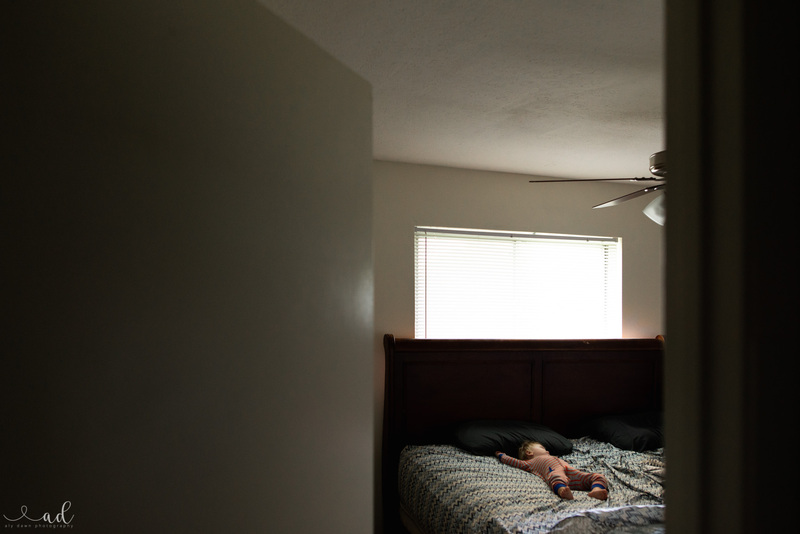 But by keeping these compositions in mind while taking images of your toddler (or anything!!) it will help strengthen your photography instantly.